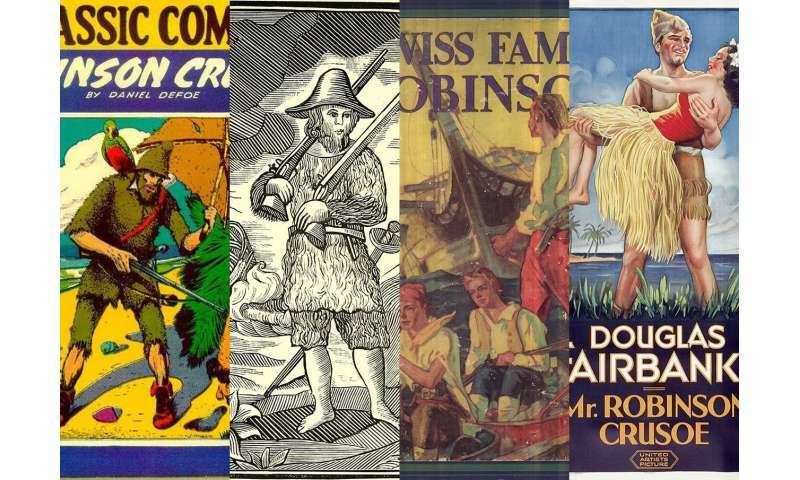 Since Daniel Defoe's shipwreck tale "Robinson Crusoe" was first published nearly 300 years ago, thousands of editions and spinoff versions have been published, in hundreds of languages. This summer, Glass' team in the Data+ summer research program used computer algorithms and machine learning techniques to sift through 1,482 full-text versions of Robinson Crusoe, compiled from online archives. "A lot of times we think of a book as set in stone," Glass said. "But a project like this shows you it's messy. There's a lot of variance to it." "When you pick up a book it's important to know what copy it is, because that can affect the way you think about the story," Glass said. The books were already scanned and posted online, so the students used software to download the scans from the internet, via a process called "scraping." But processing the scanned pages of old printed books, some of which had smudges, specks or worn type, and converting them to a machine-readable format proved trickier than they thought. The software struggled to decode the strange spellings ("deliver'd," "wish'd," "perswasions," "shore" versus "shoar"), different typefaces between editions, and other quirks. Special characters unique to 18th century fonts, such as the curious f-shaped version of the letter "s," make even humans read "diftance" and "poffible" with a mental lisp. Their first attempts came up with gobbledygook. "The resulting optical character recognition was completely unusable," said team member and Duke senior Gabriel Guedes. Guedes pointed to clusters of dots on a network graph. "Here, the red editions are American, the blue editions are from the U.K.," Guedes said. "The network graph recognizes the similarity between all these editions and clumps them together." The algorithm takes in chunks of texts—sentences, paragraphs, even entire novels—and converts them to high-dimensional vectors. Creating this numeric representation of each book, Guedes said, made it possible to perform mathematical operations on them. They added up the vectors for each book to find their sum, calculated the mean, and looked to see which edition was closest to the "average" edition. It turned out to be a version of Robinson Crusoe published in Glasgow in 1875. They also analyzed the importance of specific plot points in determining a given edition's closeness to the "average" edition: what about the moment when Crusoe spots a footprint in the sand and realizes that he's not alone? Or the time when Crusoe and Friday, after leaving the island, battle hungry wolves in the Pyrenees? The team's results might be jarring to those unaccustomed to seeing 300 years of publishing reduced to a bar chart. But by using computers to compare thousands of books at a time, "digital humanities" scholars say it's possible to trace large-scale patterns and trends that humans poring over individual books can't. "This is really something only a computer can do," Guedes said, pointing to a time-lapse map showing how the Crusoe story spread across the globe, built from data on the place and date of publication for 15,000 editions. "It's a form of 'distant reading'," Guedes said. "You use this massive amount of information to help draw conclusions about publication history, the movement of ideas, and knowledge in general across time." A facet of the issue here, I've already mentioned elsewhere. Converted to movies, certainly, certain novels are presented with less attention to the original story, others are held very close to the book. Generally, these are science fiction of fantasy or horror or such stories. Many if not most versions of "The First Men In The Moon", "The Lost World", "The Time Machine", "The Master Of The World", "Mysterious Island", "Journey To The Center Of The Earth" vary significantly from the original, many involving such things as love interests, antagonists, sub plots. Works like "Hamlet", "The Red Badge Of Courage", "Tom Sawyer", "The Last Of The Mohicans" are generally followed very close to the original. It should be mentioned that this article is unusual for the fact that no actual results or discoveries seem to be mentioned.